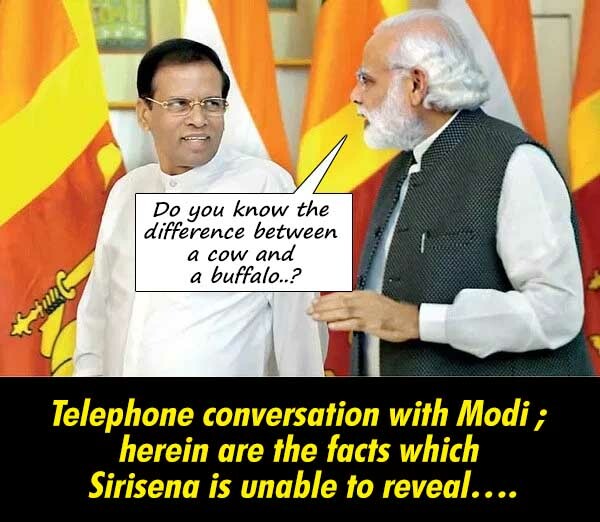 LEN - www.lankaenews.com | Telephone conversation with Modi ; herein are the facts which Sirisena is unable to reveal…. (Lanka e News -22.Oct.2018, 11.45PM) It was Lanka e News which is first with news and best with the views that first revealed with evidence the assassination conspiracy against the president is a concocted fairy tale . Truly it was nothing except an offshoot of dog eating dog rivalry among the DIGs. It was the lackeys and lickspittles clustered around the president who gave the interpretation that there exists a conspiracy to murder the president and defense secretary. The main objective was to help Sirisena whose popularity base has plummeted to a 4 % and therefore in a dismal state to negotiate a deal with the Rajapakses. In fact this entire drama was orchestrated by Sirisena himself. Unfortunately for Sirisena alias Sillysena the time bomb exploded when he made an announcement at the cabinet meeting on the 16 th that the RAW organization is conspiring to murder him . Lanka e News was the first to expose Sirisena’s outrageous statement , and with the Hindu newspaper reporting it subsequently , the Indian government called for an official explanation from the SL High Commissioner in India and the Indian High Commissioner in SL . The gravity of Sirisena alias Sillysena’s statement was understood by Sirisena only when the High Commissions began to feel the heat of the issue. Do you know the difference between a cow and a buffalo ? Sirisena who is most famous for leaping before thinking having realized his folly and the indiscretion he has committed had desperately tried to phone Narendra Modi on several occasions from 17 th morning. Because Modi was busy with the ‘Dasahara’ celebration which is a commemoration without consuming food in accordance with Hindu customs, it was only on 17 th evening Sirisena got the opportunity to speak with Modi. The latter had at the outset spoken about the importance of the Dasahara commemoration . That is the commemoration of the final battle waged by Rama against the ten faced Ravana. Modi in fact by talking about it was mocking at Sirisena. Sirisena , as soon as he got the opportunity to speak started blabbering that he never said anything about RAW organization , and this was a conspiracy of his cabinet of ministers to create enmity between the two countries which are having cordial ties. Modi who listened patiently , then asked from Sirisena whether he knows the difference between a cow and a buffalo? A hindu proverb says ,when a cow is struck with a stick to discipline it , the cow does not repeat the same mistake whereas a buffalo is different. Whether Modi referred as buffalo to Sirisena or Sirisena’s cabinet is however obscure. When Sirisena was going on saying RAW is not linked to the murder conspiracy like an accused desperately defending himself, , Modi had questioned , how can he say RAW is involved or not when the investigations are not yet concluded? Sirisena had no answer to give for that question. Modi had then warned Sirisena that since India considers SL as its closest friend , he should learn to guard his tongue. The Sirisena –Modi discussion lasted about 5 mins. It was very evident Modi ‘s words were extremely harsh. Prior to his telephone conversation with Modi , the president issued a media communique that he did not tell anything about a RAW conspiracy to murder Sirisena. This was sent to the High Commissions of India in SL and SL’s High Commission in India. At the same time India’s response in this connection was also published. India’s response did not whitewash Sirisena and throughout the article it was mentioned this is a most serious matter. Perhaps Sirisena must have assumed like how he is pulling the wool over the eyes of the Sri Lankan public and the parties that propelled him to power, by saying all the lies and practicing all the deceptions he can get away with this ploy too. He thought by this he can become a ‘hero’ .Sadly for him he did not understand he cannot fool India like he fools the locals. When the plan boomeranged , he tried to escape from the misfortune of which he is the architect . Ultimately he had to swallow the gall of indignity and ignominy in silence before Modi’s ‘shelling’ . Faceless ,rudderless, policy less Sirisena who is clever at double speak and double acting through his equally slimy go between Shiral Lakthileke ( notorious NGO crook) has resumed the assassination ‘drama’ . After finding another lawyer Kongahage when he could not get any other , Shiral convened a media briefing . This time , both of them said ‘ we are serious’ . Grade 8 qualified Weerawansa who knows only about phony passports and passport frauds trying to act as ‘identity card specialist ‘ is the biggest joke of the century . It is only an uneducated imbecile like Weerawansa who thinks International Intelligence divisions use identity cards. This is the Modawansa pretending to know about international intelligence division identity cards who pretended to know nothing about the murdered youth in his own house. However Rajapakses declared, that was a story invented by Weerawansa who is now washing pots and pans in Sirisena’s kitchen . They completely dissociated themselves from Weerawansa alias Modawansa’s views. .
Modawansa the buffoon who is unable to stop his tomfoolery went one step further , to distort the statement of Hindu reporter Meera Sirinivasan using Weerawansa’s website while implicating a minister of the government indirectly. According to Meera during the media discussion the truths and untruths were confirmed about Sirisena’s ‘RAW story’ based on what were told by the group of cabinet ministers of ‘cross colors’ or ‘rainbow colors’ representing several parties because he could not ascertain clearly the true party affiliations of the ministers from whom he obtained the confirmation regarding the news. However Weerawansa alias Modawansa in his characteristic style through his website gave a mischievous twist to the ‘cross colors’ and concocted a filthy ‘homosexual’ story . It is anyway crystal clear without any doubt , it is Sirisena who is fanning the hellfire of the demons Weerawansa , Shiral and Kongahage against the Hindu newspaper and RAW organization. The indications are , the conduct of Sirisena is inexorably drawing to a grinding halt. The International community will only accept the character certificate about SL’s leader and the certificate about the country issued by India. As S.B. Dissanayake disdainfully said , by this episode , it is a ‘ dog mark’ that has got tagged on to Sirisena’s character. Meanwhile India has officially requested SL on the 17 th to conduct an expeditious investigation into this so called murder conspiracy implicating India. Very soon it will come to light the suspect who is supposed to be an Indian national is just a figment of Sirisena’s imagination and a result of his mentally deranged condition..
A former officer of the Intelligence division of the forces.